I know Lenore is gorgeous. I have started the new socks. Yes, I am going toe-up (what did you expect, gentle reader?). Lenore will remain my carry to work knitting. But, about 1-inch into Lenore, I really started itching to get The Great Green Glob (aka The Pacific Northwest Shawl) finished. You can go look at the picture of the finished product if you want. I’ll wait. You know I’ve been trying to be lace-monogamous (socks don’t count). And I have at least a couple of lace projects that I’d really like to start on. And one is going to be really special for reasons that I can not yet divulge. So I really want to get this choke chain around my neck project completed, blocked and wearable — in other words, DONE. I fetched The Great Green Glob out of the little orange bag in which it has lived for all of its long, long life and realized that I was actually much further along than I thought. I was ready to start the fish pattern. It’s only 12 rows, of which only 1/2 are pattern and the rest are straight K. Then there was just the final bubble pattern (8 rows) to finish the main body of the shawl. 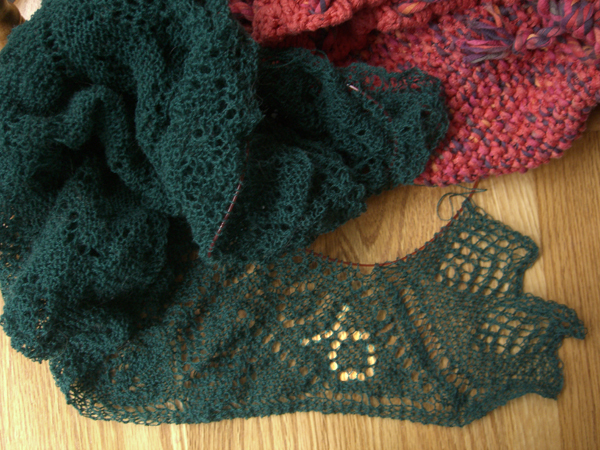 Realize that by the time the final bubbles are finished, the body of the shawl is 385 stitches. So a row takes awhile to knit. And I find that I cannot knit this lace quickly, even on the straight K rows. It might be the needles. I currently have it on an Addi Lace circ — which I love — but it might not be pointy enough. I think I will switch to a Knit Picks options and see if that bring back a little of the love. I did marathon lace knitting yesterday, fortified by coffee, frozen pizza, beer (homemade by a friend, yummy), and multiple free movies courtesy of On Demand cable viewing. I knit all of the fish, all of the bubble, and two repeats of the shell edging. It all looks a little wonky right now, sans blocking. I’ve used Photoshop to brighten up the YOs in one of the fish, so you can see it better. Now it’s just a run around the border. Which, I calculate, is approximately 650 rows of knitting. But these rows are only 14 stitches long. Then the final I-cord edging. And it will be done. Think I can make it by Christmas? Stay tuned to this channel for updates.